Dienekes’ Anthropology Blog: Cave painters painted spotted horses as they saw them. Fascinating study. Personally, I never felt that there was a need to inject symbolism into figurative art such as the cave paintings. They are perfectly astonishing the way they are, and represent fully-modern behavior with or without modern interpretations. Very interesting. So after all, these cavemen were painting realistic art, instead of imaginary beings. This can new interpretations to other paleolithic works of art. The painting does seem to have a little artistic license in it too, so human imagination was well developed, and likely had been for many thousands of years. Did we stand on our hind legs to see the moon better and gaze at the art of the clouds in the sky? Or was it only after we stood to get a piece of fruit, that we noticed the moon and the clouds as art? Beauty and wonder are indeed in the eye and mind of the beholder. Emphasis on realistic rendering seems to be a particular feature of palaeolithic European art. It's the quality that makes the art works so astounding to us today because we value that aesthetic quality as well. I recently watched Herzog's 3D film "The Cave Of Forgotten Dreams" about the art in the Chauvet cave. It was strange to see the depictions of so many animal types that I could name but which appeared in such unfamiliar forms and proportions, because most of the actual species are now extinct. In the film someone commented that we wouldn't know that the European lions of that period didn't have manes if it wasn't for their depictions in the cave paintings. Right, the limbs and anterior proportions, and that corona of spots around their bodies too. That said, this article's leading me to recall some offhand speculations about those "Venus" figurines (whatever their ritual investment). Nigel Spivey's by no measure a specialist in this time period (he's a classicist), but he seems to echo prevalent assumptions in wondering: We want to know why our Paleolithic ancestors exaggerated, to a grotesque extent, certain features of these Venus figurines (from a companion book to a television documentary of the same name, How Art Made the World). I wonder whether he's not sidestepping an important possibility here -- that some of these carvings might be more realistic than modern-day observers would tend to conclude, and attest to the presence of a genuine steatopygia/steatomeria complex in Upper Paleolithic Europe. Slightly OT but speaking of painted spots, the ones below may indicate there was perhaps cave painting in central Europe, after all, and that there were people there very shortly after LGM (and thus, there may have been local refugia - such as the upper Rhine or the Danube). Swabia seems to be a fascinating area for prehistoric art such as the half human half lion sculpture known as the lion man. It's the oldest sculpture that's ever been found. Definitely something symbolic going on there. Although the Chauvet cave is generally lacking depictions of humans, there is an image of a human figure with the head of a bull. Also the Chauvet caves has a panel consisting of red dots. "I am innately skeptical of "symbolism" when it comes to most ancient art"
It's possible that horses with certain aberrant coat coloring had symbolic significance in and of themselves because they were rare and thus paintbrush worthy. "prehistoric art such as the half human half lion sculpture known as the lion man...an image of a human figure with the head of a bull"
Have a feeling that life preceded art in both cases, with the credited victors attempting to gain the strength of the fallen 'Great Ones' by putting themselves "inside" their prey after the kill. 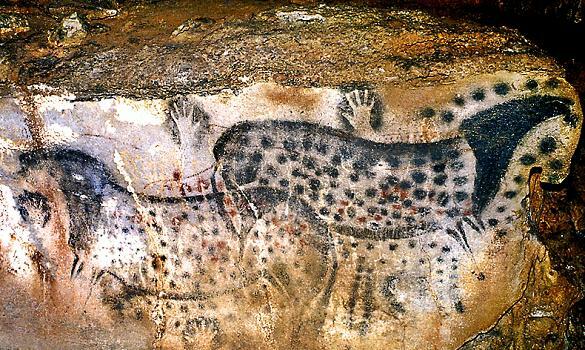 Researcher Graham Hancock has done some fascinating work by looking at cave art from around the world and comparing to modern hallucinogenic and entheogenic experiences. It would be very interesting if these art works were created by a people who also had a working knowledge of hallucinogens and used such compounds in spiritual rituals.